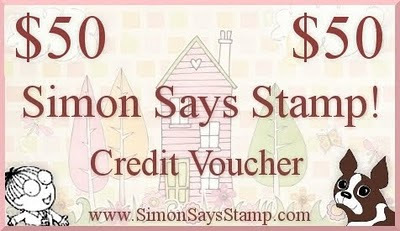 Simon Says Stamp Challenge: Winners !!!!!!!!! Okay, I've checked at least 10 times now... I am satisfied that that REALLY is my name there!! OMG!!! I'm SOOOOOO unbelievably excited!! I never win anything and was just popping over to check out this weeks challenge! Thank you so much!! what an AWESOME belated Birthday Present! Yay, congrats on so many entries! !